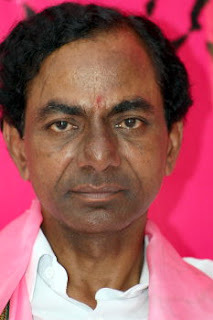 For the first time, when I saw an image of this man - Mr. K. Chandrashekar Rao - a very thin figure with a funny ping colored shawl, I never thought this man had so much of determination and will power. I really don't know if he had used this separate Telangana state issue for popularity in politics or for some real valid reasons, but I am really surprised by the way he continued his protest till the Central Government agreed. In my state, I have only seen politicians doing this fasting protest between their break-fast and lunch. Now, there is an additional new state in our country, a new chief minister post and 25+ minister posts. Lets hope with such governing body and a small state, Telangana will improve in future as they expect. also I get few questions in my mind, - Will some Andhra Mess rename themselves as Telangana Mess, now??? Somone please help me.